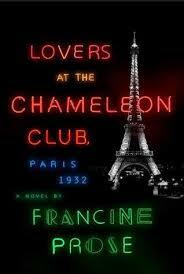 Lovers at the Chameleon Club, Paris 1932 by Francine Prose is historical fiction about a group of people living in Paris prior to, during, and after World War II. It took me a long time to read this 400+ page book. The story is told through the eyes of a Hungarian artist, a baroness, a lesbian Nazi sympathizer, and an American born writer. Hence, the title of this review! The ever-changing points of view in this story caused me to take my time reading the novel. The story is engrossing and once I got into it, I really liked it right up until the end, when the author lost me completely. I am not one who enjoys trying to figure things out when I’m reading a book. I like the endings to be completely clear and I totally didn’t get the very end of this book. I reread the last two chapters thinking perhaps I missed something, but still felt as if the author switched train tracks and left me hanging. While I understand there are deeper implications about life and love in this book, I found parts of it repetitive and noticed some “guns” introduced which were “never fired”. Still, I would recommend this book to those who are interested in and enjoy World War II stories. Much of what I read struck me as believable. I only wish the ending had not baffled me so. If any of my followers have or will read this book, please share your feedback with me. I’m find I am at a loss after long hours spent reading it. This entry was posted in Uncategorized and tagged 1932, France, Francine Prose, Lovers at the Chameleon Club, Paris, Picasso, spies, WWII. Bookmark the permalink. I heard the author interviewed on NPR and it sounded interesting. But like you, I do like to be able to follow along with the author rather than be confused and left behind. I also love books about and around WWII but it seems to be very popular right now so I am getting a little weary of it. This review made my decision to meander to other books first. Thank you! It was pretty good up until the ball drop of an ending. Am reading The monuments men now, quite good so far. Have you read it yet? I was going to try & find a copy of the book, but doubt it will appear in our bookstores. Having read your comments, think I’ll leave it aside. I also dislike books that leave me perplexed right at the end. Thanks for your comment Alison! I am glad I’m not alone! So little time, so many books to read – I am disappointed when this happens.